WASHINGTON (AP) — Before signing up with Donald Trump, former campaign manager Paul Manafort secretly worked for a Russian billionaire with a plan to “greatly benefit the Putin Government,” The Associated Press has learned. The White House attempted to brush the report aside Wednesday, but it quickly raised fresh alarms in Congress about Russian links to Trump associates. White House spokesman Sean Spicer said Wednesday that President Trump had not been aware of Manafort’s work on behalf of Deripaska. Manafort’s plans were laid out in detailed documents obtained by the AP that included strategy memoranda and records showing international wire transfers for millions of dollars. How much work Manafort performed under the contract was unclear. The work appears to contradict assertions by the Trump administration and Manafort himself that he never worked for Russian interests. The disclosures come as Trump campaign advisers are the subject of an FBI probe and two congressional investigations, and they appear to guarantee that Manafort will be sought as a key witness in upcoming hearings. Investigators are reviewing whether the Trump campaign and its associates coordinated with Moscow to meddle in the 2016 campaign. Manafort has dismissed the investigations as politically motivated and misguided. The documents obtained by AP show Manafort’s ties to Russia were closer than previously revealed. Sen. John McCain, R-Ariz., called the disclosures “serious stuff” and more evidence that an independent congressional committee should investigate the Trump administration. “Other shoes will drop,” he said. Democrats on the House intelligence committee said the new revelations will feature in their investigations. Deripaska became one of Russia’s wealthiest men under Putin, buying assets abroad in ways widely perceived to benefit the Kremlin’s interests. U.S. diplomatic cables from 2006 described him as “among the 2-3 oligarchs Putin turns to on a regular basis” and “a more-or-less permanent fixture on Putin’s trips abroad.” In response to questions about Manafort’s consulting firm, a spokesman for Deripaska in 2008 — at least three years after they began working together — said Deripaska had never hired the firm. Another Deripaska spokesman in Moscow last week declined to answer AP’s questions. Manafort worked as Trump’s unpaid campaign chairman last year from March until August, a period that included the Republican National Convention that nominated Trump in July. Trump asked Manafort to resign after AP revealed that he had orchestrated a covert Washington lobbying operation until 2014 on behalf of Ukraine’s ruling pro-Russian political party. The newly obtained business records link Manafort more directly to Putin’s interests in the region. According to those records and people with direct knowledge of Manafort’s work for Deripaska, Manafort made plans to open an office in Moscow, and at least some of his work in Ukraine was directed by Deripaska, not local political interests there. The Moscow office never opened. Manafort has been a leading focus of the U.S. intelligence investigation of Trump’s associates and Russia, according to a U.S. official. The person spoke on condition of anonymity because details of the investigation are confidential. Meanwhile, federal criminal prosecutors became interested in Manafort’s activities years ago as part of a broad investigation to recover stolen Ukraine assets after the ouster of pro-Russian President Viktor Yanukovych there in early 2014. No U.S. criminal charges have ever been filed in the case. 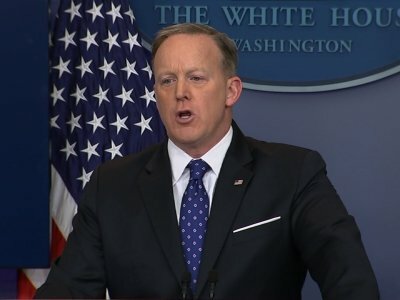 On Monday, Spicer had said Manafort “played a very limited role for a very limited amount of time” in the presidential campaign, even though he was Trump’s campaign chairman. Spicer on Wednesday said further that Manafort was hired to oversee the campaign’s delegate operation. “To be clear, he got the job done on the delegates,” Spicer said. Manafort and his associates remain in Trump’s orbit. Manafort told a colleague this year that he continues to speak with Trump by telephone. Manafort’s former business partner in eastern Europe, Rick Gates, has been seen inside the White House on a number of occasions, helped plan Trump’s inauguration and now runs a nonprofit organization, America First Policies, to back the White House agenda. Gates, whose name does not appear in the documents, told the AP that he joined Manafort’s firm in 2006 and was aware Manafort had a relationship with Deripaska but was not aware of the work described in the memos. Gates said his work was focused on domestic U.S. lobbying and political consulting in Ukraine at the time. He said he stopped working for Manafort’s firm in March 2016 when he joined Trump’s presidential campaign. Manafort told Deripaska in 2005 that he was pushing policies as part of his work in Ukraine “at the highest levels of the U.S. government — the White House, Capitol Hill and the State Department,” according to the documents. He also said he had hired a “leading international law firm with close ties to President Bush to support our client’s interests,” but he did not identify the firm. Manafort also said he was employing unidentified legal experts for the effort at leading universities and think tanks, including Duke University, New York University and the Center for Strategic and International Studies. For the $10 million annual contract, Manafort did not use his public-facing consulting firm, Davis Manafort. Instead, he used a company, LOAV Ltd., that he had registered in Delaware in 1992. He listed LOAV as having the same address as his lobbying and consulting firms in Alexandria, Virginia. In other records, LOAV’s address was listed as Manafort’s home, also in Alexandria. Manafort sold the home in July 2015 for $1.4 million. He now owns an apartment in Trump Tower in New York, as well as other properties in Florida and New York. Davis said he believes Manafort used his name without his permission on the strategy memo. “My name was on every piece of stationery used by the company and in every memo prior to 2006. It does not mean I had anything to do with the memo described,” Davis said. He took a leave of absence from the firm in late 2006 to work on Sen. McCain’s 2008 presidential campaign. Associated Press writers Jack Gillum, Eric Tucker, Julie Pace, Ted Bridis, Stephen Braun, Julie Bykowicz and Monika Mathur contributed to this report in Washington; Nataliya Vasilyeva contributed from Moscow and Kiev, Ukraine; and Jake Pearson contributed from New York.